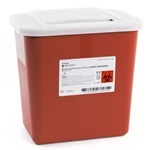 Red 1 quart multi-use sharps container that measures 6.25" high, 4.25" wide, and 4.25" deep. Plastic container is plastic with a locking, hinged vertical entry lid. Manufactured by McKesson. **THIS ITEM IS CURRENTLY ON BACKORDER. 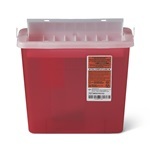 ** Red 1.5 quart phlebotomy sharps container that measures 9" high, 4.5" wide, and 4" deep. Plastic container is one piece with a non-locking, vertical entry lid. Manufactured by BD. 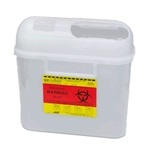 Translucent 2 quart multi-purpose sharps container that measures 6.25" high, 10.75" wide, and 4.75" deep. Plastic container is one piece with a locking, horizontal entry lid. Manufactured by Covidien. **THIS ITEM IS CURRENTLY ON BACKORDER. 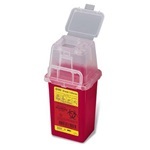 ** Red 2.2 quart AutoDrop phlebotomy sharps container that measures 7.25" high, 6.5" wide, and 4.47" deep. Plastic container is one piece with a locking, vertical entry lid. Manufactured by Covidien. 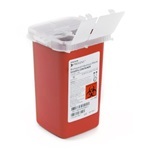 Red, oval 3.3 quart multi-purpose sharps container that measures 5.5" high, 8.5" wide, and 5" deep. Plastic container is one piece with a non-locking, funnel lid. Manufactured by BD. 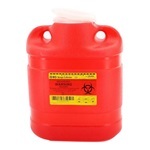 Red 1 gallon multi-purpose sharps container that measures 6.25" high, 10.5" wide, and 7" deep. Plastic container is 2 pieces and has a flat sliding lid that locks for final disposal. Manufactured by Medline. 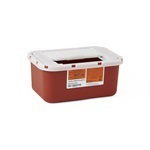 Red McKesson Prevent 5 quart multi-purpose sharps container that measures 10.75" high, 10.5" wide, and 4.75" deep. Plastic container is two piece with a locking, horizontal entry lid. Manufactured by McKesson. **THIS ITEM IS CURRENTLY ON BACKORDER. 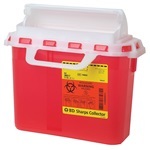 ** Red 5 quart multi-purpose sharps container that measures 11" high, 10.75" wide, and 4.75" deep. Plastic container is one piece and has a locking, horizontal entry lid. Wall mount compatible. Manufactured by Medline. 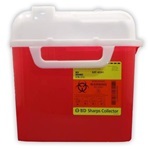 Red 5 quart multi-purpose sharps container that measures 10.75" high, 10.75" wide, and 4" deep. Plastic container is one piece with a non-locking, horizontal entry lid. Manufactured by BD. 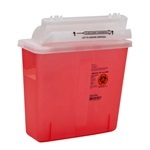 Red 5 quart multi-purpose sharps container that measures 10.75" high, 10.5" wide, and 4.75" deep. Plastic container has a non-locking, horizontal entry lid. Manufactured by Plasti-Products. Comes 20 per case. Translucent SharpStar In-Room 5 quart multi-purpose sharps container that measures 12.5" high, 10.75" wide, and 5.5" deep. Plastic container is one piece and has a locking, horizontal entry lid. Manufactured by Covidien. **THIS ITEM IS CURRENTLY ON BACKORDER. 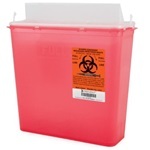 ** Translucent red 5 quart multi-purpose sharps container that measures 12.5" high, 10.75" wide, and 5.5" deep. Plastic container is one piece with a locking, horizontal entry lid. Manufactured by Covidien. 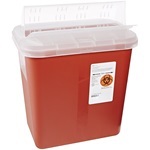 Translucent Red 5 quart multi-purpose Sharps-A-Gator sharps container that measures 12.25" high, 11" wide, and 4.25" deep. Plastic container is one piece with a non-locking, horizontal entry lid. Manufactured by Covidien. 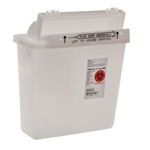 Pearl 5.4 quart multi-purpose sharps container that measures 10.75" high, 10.75" wide, and 4" deep. Plastic container is one piece with a non-locking, horizontal entry lid. Manufactured by BD. **THIS ITEM IS CURRENTLY ON BACKORDER. 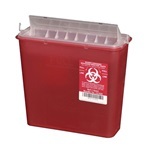 ** Red 5.4 quart multi-purpose sharps container that measures 10.75" high, 10.75" wide, and 4" deep. Plastic container is one piece with a locking, horizontal entry lid. Manufactured by BD. **THIS ITEM IS CURRENTLY ON BACKORDER. 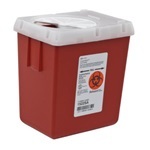 ** Red 5.4 quart multi-purpose sharps container that measures 10.75" high, 10.75" wide, and 4" deep. Plastic container is one piece with a non-locking, horizontal entry lid. Manufactured by BD. **THIS ITEM IS CURRENTLY ON BACKORDER. 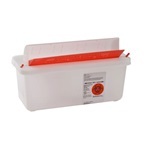 ** Red 2 gallon SharpSafety multi-purpose sharps container that measures 12.75" high, 10.5" wide, and 7.25" deep. Plastic container has locking lid. Manufactured by Covidien. **THIS ITEM IS CURRENTLY ON BACKORDER. 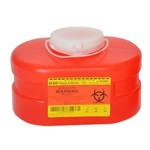 ** Red 2 gallon multi-purpose sharps container that measures 12" high, 13.5" wide, and 6" deep. Plastic container is one piece and has locking, horizontal entry lid. Manufactured by BD. 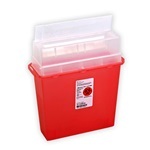 Red 2 gallon multi-purpose sharps container that measures 10.25" high, 7" wide, and 10.5" deep. Plastic containe has locking lid. Manufactured by McKesson.